Explore This: Will StageIt Make Virtual Concerts More Intimate? Continuing our exploration virtual concert experiences, a creative partnership between startup StageIt and L.A.-based Coffee Bean & Tea Leaf is giving music fans a new way to discover and support their favorite artists live shows online. As Mashable reports, this unique online concert experience fills a gap and meets the needs of not only concert fans who want to catch a show on the net, but it also allows artists to make a few extra beans in the process. StageIt solves a problem the music and tech industries have been working on for a couple of years: How can musicians make money online beyond just selling tracks and merchandise? The startup lets fans and “superfans” purchase virtual tickets for webcam-based performances that include live chats with the artist. And taking a deeper look at StageIt’s mission, it’s obvious that they’re aiming to change not only the way fans experience live music during the show, but they are aiming to explore the influence of the before and after. StageIt isn’t about broadcasting concerts online. It’s about sharing the amazing moments that happen in between. Did a friend drop by to jam? StageIt. Got a new tune you’re working on? StageIt. Getting ready to go on stage? StageIt. And when it comes to virtual currency, StageIt also has an interesting functionality that allows you to tip an artist directly by using the TIP button on the video player during the show. And that’s where part of the money making aspect for the artist comes in. Like we’ve explored before with Recreate My Night and BigLive, we’ll continue to see how StageIt will evolve and how the overall experience plays out as fans and artists use the site more. Will this create a more intimate connection between fans and bands during the live music experience? Will StageIt have an innovative impact on the non-virtual concert experience? That said, we encourage you to check it out and explore with us. 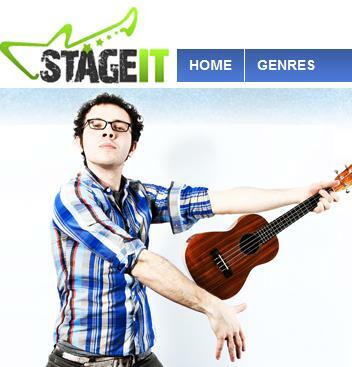 And if you’re a fan or an artist who’s used StageIt before, we’d love to hear what you think of it so far. Share your stories and comments below! Is Google Introducing A New Concert Tablet Trend? I have had the opportunity to experience StageIt many many times and I have to say that every time that I log in to see a show I know that there is an “experience” awaiting me. With the live chats I have the opportunity to request songs, ask the artist questions or just chat with the other members of the audience. Don’t get me wrong I love going to concerts when artists visit my area, and that won’t change, but how often at a concert can you ask questions….or get the artist to say hi to your kids….or request a song and have them play it!!! I also love the fact that I don’t have to drive to a venue or pay a baby sitter….I can enjoy any show right from the comfort of my favorite chair!!! I think anyone that has the opportunity to check out StageIt will find that it truly is a front row seat to a back stage experience…..and what a back stage experience it IS!!! I’ve had the pleasure of experiencing StageIt since the fall last year and have attended over 100 performances now. I look forward to the intimacy of the shows, the connections with the artists and performers and the fans. StageIt offers a truly unique experience and window into the souls of the artists who are eager to share that with their fans. One never knows who may drop in on a show to play or say hello or do a spot interview with the fans. And one never knows what will happen – it is after all a live experience! What I love about StageIt is that it isn’t the video you can download on the internet or the viral video from the show you didn’t get to see … YOU”RE THERE – front and center!! It’s convenient, it’s personal, it’s intimate, and it can’t be replicated! Sometimes crazy things happen and we laugh about it, together, around the world. You can’t get that at a concert or anywhere else. The best part I think is the exposure I’ve gotten to new artists I wouldn’t have seen otherwise. You may hear about it during a show, or before a show, or even after… I always know who is playing either from StageIt or the fans or artists. There is always a performance to look forward to and you never know when an impromptu performance or encore will pop up! StageIt rocks! To know it, just StageIt and see! How would you all compare your StageIt experience to other similar online concert experiences?